Carmelo Mesa-Lago, Distinguished Service Professor Emeritus of Economics and Latin American Studies, former director of the University of Pittsburgh’s Center for Latin American Studies and author of over 90 books on economic and social policy in Latin America, approached his new book on Cuba’s non-state economic sector differently than he has done for past books. Voces de cambio del emergente sector no estatal en Cuba (“Voices of change in the emergent non-state sector of Cuba”) is the outcome of a two-year project of a team coordinated by Mesa-Lago, and he conducted the research with a method he had never used before: personal face-to-face interviews. Two Cuban social scientists interviewed 80 Cubans working in the non-state sector--including private, cooperative, and mixed--in a process which took over a year to accomplish. Answers were tabulated by doctoral candidate at the University of Pittsburgh Political Science Department Sofía Vera, supervised by Prof. Aníbal Pérez-Liñán. Some of the study’s unexpected results shed new light on the fledgling non-state sector which, while expanding rapidly, remains constrained by government limitations. “For me, it was a unique experience because I got the feeling I was listening to the Cubans,” Mesa-Lago said of the interview process when I spoke to him about the new book. By himself he could not conduct the interviews, he explained, because to do so he would have to solicit permission from the government and get a special visa to do the work in Cuba. Instead he prepared a questionnaire which he submitted to the two Cuban social scientists for review; after making necessary amendments, the two Cubans sat down with the interviewees and asked the questions. “That was an excellent factor in the success of the interviews,” he added, “because the two colleagues are Cuban, and reside there.” The interviewees opened up to their fellow citizens in a way that, in all likelihood, they would not have to a foreigner. Mesa-Lago was careful to note that the study’s subject pool of 80 is not representative of the universe of the non-state sector, which today numbers over one million workers. Even so, he said, the study retrieved “very important information that was not available before” on self-employed workers and, especially, on farmers using state-owned land, members of new cooperatives, and buyers/sellers of private dwellings. The open nature of the questions produced lengthy, in-depth responses, Mesa-Lago said, resulting in a profundity missing from other studies conducted among groups in this sector in Cuba. “It was not simply a check type of answer in which you provide the interviewee with, let’s say, five alternative answers, and he or she checks one. No, that was not the way it was done,” he explained. “The questions were open-ended, their answers took anywhere between 1.5 and 2 hours, and the interviewees had complete freedom to express themselves, so in the book you are listening to their voices.” The questionnaire included questions on how satisfied the interviewees were with their work and their earnings, whether they had profits, faced competition, received foreign remittances or microcredit, and so forth. “There were many surprising answers,” he says, among them that 80 percent of those interviewed proclaimed themselves to be “satisfied with what they do and earn.” Though interviewees were reluctant to quantify their earnings, instead characterizing them with phrases like “a little bit” or “a lot,” the Cubans were very open about their success. Also surprising was that 93% of all interviewees had a profit and two-thirds of them fully or partly invested their profits in the micro-business. “We never thought that this would be the case because the number of obstacles these people face is considerable,” Mesa-Lago said. The two problems most often cited by the interviewees, on average across the different groups, were governmental restrictions on their work, and lack of access to and high prices of needed inputs. For instance, there are 201 self-employment occupations authorized but most of them, such as water-suppliers, street workers, clowns, and caretakers of restrooms, require very low skill, whereas very few authorized occupations, such as real-estate agents, translators and bookkeepers, require high skill. Furthermore, “all graduates from the universities, all professionals, cannot do self-employment work in their own profession” in which they trained. Take a Cuban with a degree in, say, architecture, a degree which was earned at a public Cuban university. This man cannot legally work as an architect unless he is working for the state. However, he can work in a low-skill job, such as driving taxis, which would render his training useless, a loss of the huge human capital that Cuba has. Many people who cannot make ends meet on their meager state salaries are forced to privately work “por la izquierda,” or illegally. The architect with the university degree may provide his skills to clients who can pay him/her much more than the state does. Teachers, all of whom are public employees by law, may tutor students of wealthy families on the side. Also fairly common is obtaining imports “por la izquierda.” State stores selling hard-currency merchandise not available elsewhere charge a price that brings in a profit of three times the original value; many people in the non-state sector therefore seek better prices on the black market, or steal from their state jobs. In addition, non-state sector workers cannot import or export. Mesa-Lago explained that a central focus of U.S. President Obama’s policy towards Cuba is to empower the Cuban non-state sector, so the U.S. has authorized a long list of legal imports and exports to and from non-state Cuban workers, but the Cuban government itself has yet to authorize them. Other problems that interviewees also mentioned included low access to internet and to microcredit. Not one of the 80 people interviewed had received microcredit, from a bank or the government. “All of them blamed too many requisites and too little money,” he told me. The book provides the reader with comprehensive information on the background of each of the four groups interviewed, analyzes the progress achieved and remaining hurdles, and evaluates the impact of the non-state sector on the national economy. Subsequently, the answers are quantified and analyzed, quoting the most interesting responses. 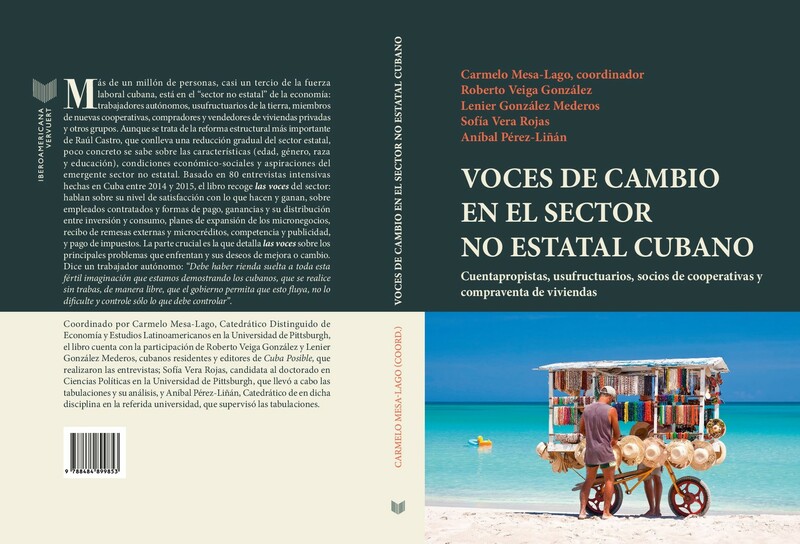 Voces de cambio del emergente sector no estatal en Cuba will arrive in stores in a Spanish edition by Madrid Editorial Iberoamericana Vervuert; an English version has been submitted to the University of Pittsburgh Press.